Author, "Life And How to Survive It"
Best known for his brilliant humor and classic TV and film performances, John Cleese is also an extraordinarily popular lecturer who enthralls packed audiences worldwide. 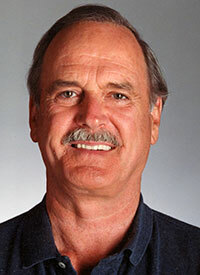 Often named “the funniest man alive,” John Cleese is both a versatile comedic actor and a leading business motivator. With the legendary Monty Python’s Flying Circus, Fawlty Towers and A Fish Called Wanda, he created a unique comedic style that has inspired countless writers and comedians. An instigator of some of the more groundbreaking developments in twentieth-century comedy, John Cleese is one of the world’s best-known actors, writers and comedians. Famous primarily for his comic efforts, such as the television series Fawlty Towers and the exploits of the Monty Python troupe, John Cleese has also become a well-respected author in his own right and has co-written such books as “Families And How to Survive Them“ (1993)and “Life And How to Survive It” (1996). For availability and speaker fees, please contact John Cleese’s speaking agent at Chartwell here, or call +1 972 385 1021 for U.S. inquiries or +44 207 293 0864 for international inquiries.